I’ve become really interested in Chinese food over the past few months. Perhaps it is due to the recent explosion of Chinese restaurants opening up in my neighborhood, or maybe it’s because I’ve started fully embracing meat as part of my diet and am now free to enjoy all of China’s wonderful meat-based dishes. Whatever the reason, this is a cuisine that’s really hitting it’s peak with me right now. It is also one I haven’t explored much beyond simple stir-fries and noodle dishes, most of which weren’t very authentic anyway. My fascination with Chinese food started earlier this year when I sampled the Gua Bao (pork belly buns) at Chino’s, a new Taiwanese-Mexican joint that opened up down the street from me. Gua Bao are steamed buns filled with braised pork belly and topped with pickled mustard greens and chopped peanuts. They are a perfect food in my book: sweet, savory, rich, crunchy, and a bit sour thanks to the mustard greens. I could happily eat these every day for the rest of my life. Chino’s also offers other interesting Chinese dishes such as Zha Jiang Mian (rice noodles with minced pork and hot bean paste), 1,000-Year-Old Egg with Tofu, and Pig’s Ear Salad (which I haven’t been brave enough to try…yet). Inspired by the new and exciting and food I’d sampled at Chino’s, I decided to try my hand at Hong Shao Rou (Red-Braised Pork), a traditional dish from the Hunan province of China. For this dish, I braised pork belly for several hours in a mixture of dark & light soy sauce, caramelized sugar, Chinese rice wine, ginger, cinnamon, and star anise. The aroma of the braising liquid as it was cooking was incredible. Pork belly can be overwhelmingly fatty and, although my Hong Shao Rou tasted fantastic, I actually found it to be unbearably rich as a standalone dish. On the other hand, a little bit tucked into a steamed bun for Gua Bao or (as I did with my leftovers) inside a toasted baguette with carrot and daikon pickles for bahn mi, and this dish goes from too rich to absolutely perfect. This week, I decided to try another famous Chinese dish: Mapo Tofu. 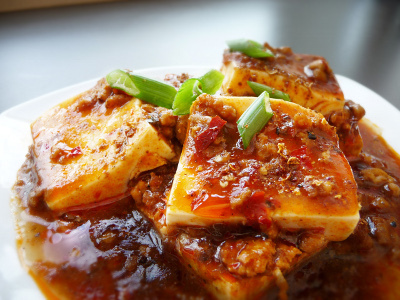 Mapo Tofu is a casual, everyday dish from the Sichuan province that is known for being especially spicy. It is easy to make but will require a trip to your local Asian grocery store for some specialty ingredients. To make this dish, you need fermented Chinese black beans, chili bean paste (also called hot bean paste) and Sichuan peppercorns. If you’ve never had Sichuan peppercorns before, be forewarned: eat enough of them and your mouth will go numb. I picked some up during my lunch break from work and then nibbled on a few once I got back to my desk. They start off with a deceptively mild peppery flavor, but that soon gives way to a tingly numbing sensation. It’s a strange feeling but one that is somewhat addictive. After the numbness had died down, I couldn’t resist grabbing a few more peppercorns to chew on. Once you have the necessary ingredients, Mapo Tofu is exceedingly easy to prepare. Simply brown some ground beef or pork in a hot wok, stir-fry your various flavorings, add stock and tofu, simmer until thickened, and garnish with chopped scallions and ground Sichuan peppercorns to taste. The result is a very spicy, highly flavorful dish. Depending on how much Sichuan pepper you add at the end, you will either experience a mild tingly sensation or a full-on mouth assault. Since I love spicy foods, I brashly added 2 heaping teaspoons of pepper to my dish. It felt slightly more like a trip to the dentist than dinner–Sichuan pepper may be one of those things you need to slowly become accustomed to (once again, however, after the numbness was over, I found myself craving more). I made a second batch of Mapo Tofu a few days later using less pepper, and it was perfect. If you love spicy dishes, you won’t want to miss this one. I wonder what new, exciting (and possibly tingly!) Chinese dish I’ll discover next? Heat a wok over high heat, then add the oil. Brown the pork or beef in the hot oil, breaking it up into small bits. Turn the heat down to medium, add the garlic and black beans, and stir-fry for 30 to 60 seconds. Add the chili bean paste and stir-fry for another 30 to 60 seconds. Stir in the stock or water, sugar and soy sauce. Add the tofu cubes. Mix gently to avoid breaking up the tofu too much. Simmer for a few minutes, then add the cornstarch mixture and cook until the sauce has thickened (this should happen right away). Sprinkle with the scallions and Sichuan pepper, to taste. *Sichuan peppercorns are typically toasted before being ground. Heat the peppercorns in a dry wok over medium heat, stirring often, until fragrant, about 2 minutes. Allow to cool, then grind in a spice grinder or using a mortar and pestle.